SIMILAR SPECIES: see under Thysanophyrs arenicola (Broadhead Flathead) for details. TAXONOMY: ANIMALIA; CHORDATA; GNATHOSTOMATA (Jawed Vertebrates); PISCES; OSTEICHTHYES; Scorpaeniformes; Platycephaloidei; PLATYCEPHALIDAE. COMMENT: SciName J.E.Randall pers.comm. 3/2000, not Eschmeyer. Rarotonga: specimen set gillnet Avatiu Pass., to BPBM Sims, ID J.E.Randall (Sims88). Special Reference: Imamura, H; Ida, H: Moyer, J.T. 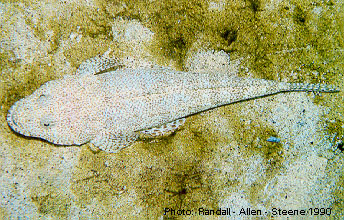 1995 Rediscription of a flathead, $Thysanophrys otaitensis@ (Scorpaeniformes: Platycephalidae). Jap. J. ichthyol. 42 (3-4):277-283. $Thysanophrys otaitensis@ is confirmed as a seniour synonym of $T. malayanus@.